Phase Two of the Protein Design Partition Tournament has been underway for one week, now. Thank you, to all the Foldit players that have been participating! 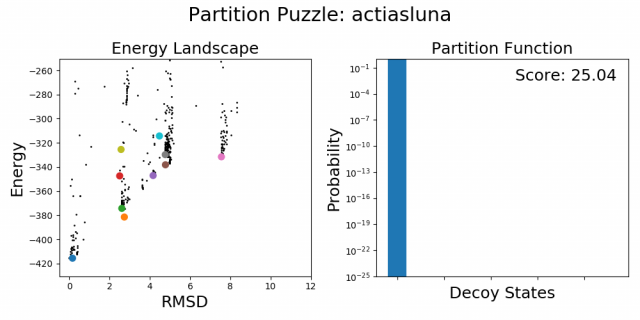 All 20 Partition Puzzles have seen initial challenges, and already we’re seeing that some designs are more resistant than others. 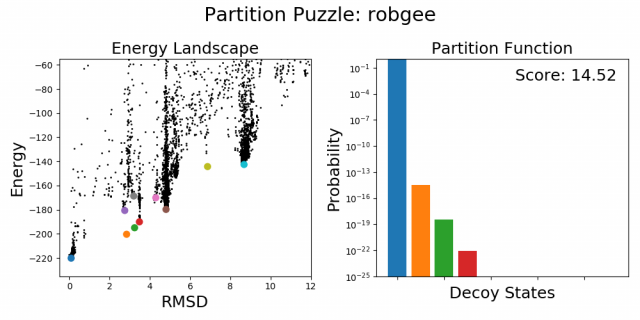 To recap: the Partition Puzzles will be evaluated by their partition functions, which we explained in a previous blog post. 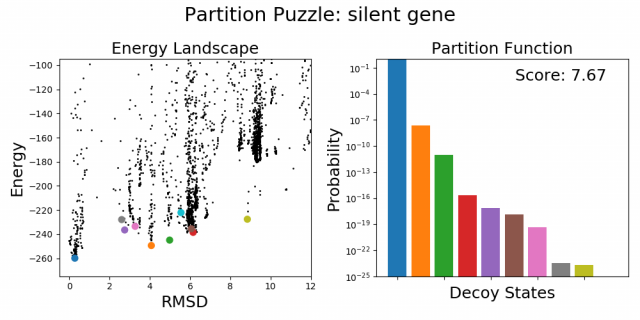 In order to calculate the partition function for a puzzle, we cluster all of players solutions to identify decoy states. The relative energy of those decoy states tells us how the ensemble will be distributed over those states. In order to rank the tournament designs, we’re using a "Partition Score” to summarize how well each design resists challenges from other players. This score measures how much of the partition function has been claimed by challengers, on a logarithmic scale, where a higher score indicates a more stable protein. 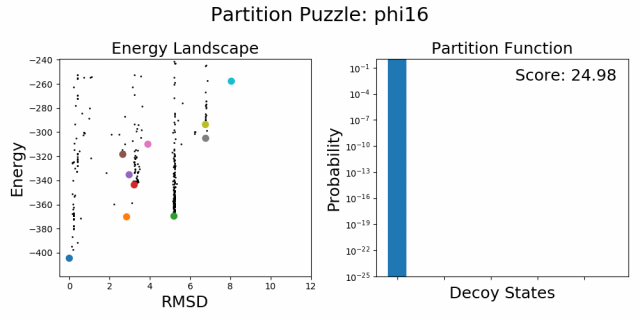 For example, a Partition Score of 12.0 means that challengers have claimed 10-12 (one trillionth) of the partition function; likewise, we could say the design is about 1012 times more likely to fold into the designed structure than all of the decoys combined. 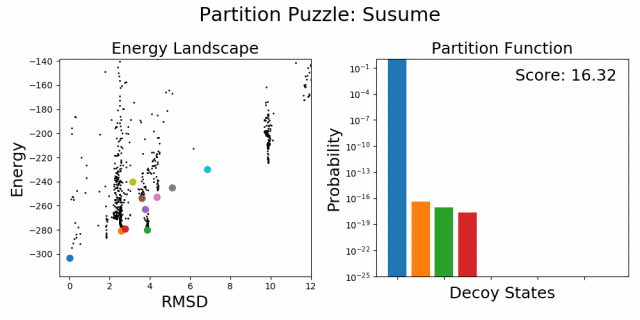 Three puzzles have a Partition Score of 0.00, meaning that challengers have found decoys that score even better than the original design. We are closing these puzzles early, so that challengers can focus on the other Partition Puzzles. Below, we'll take a closer look at the solutions from these puzzles, and what features might have led to their demise. If you want to skip ahead, the summary updates for all Partition Puzzles are at the bottom of this blog post. 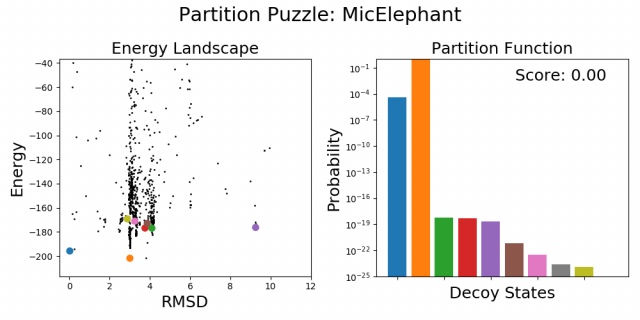 First, in Partition Puzzle: MicElephant, we see that challengers have found a decoy with an energy that is lower than the design by about 6 kcal/mol (+60 Foldit points). Taking a closer look at the decoy structure, we see that challengers have refolded one of the β-strands into a helix. In the original design, this strand was designed with all polar residues. Without any hydrophobic residues to be buried, this section of the protein will happily flop around in solution. You might think that it would be bad to break the ladder-like hydrogen bonds that were designed between this strand and its partner—however, these surface residues can compensate by making new hydrogen bonds with the surrounding water. 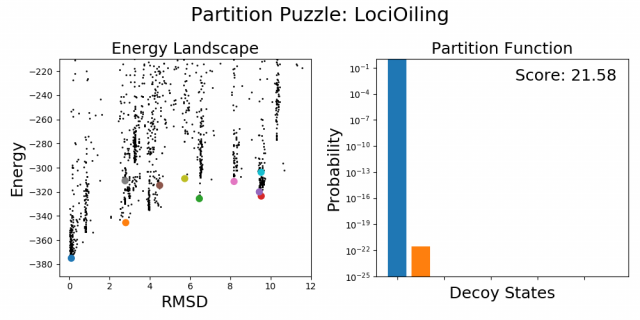 Next, in Partition Puzzle: ManVsYard, challengers have found a decoy that is lower in energy by about 4 kcal/mol (+40 Foldit points), as well as a second decoy with an energy that is about the same as the designed structure. The low-scoring decoy exposes the short helix that was packed at the top of the β-strands. Again, we see that this section was designed with entirely polar residues, which are happy to interact with the surrounding water instead of the protein. In the second decoy, challengers have completely refolded a β-strand into an α-helix. This is a little surprising, since the designed residues in this section form an alternating pattern of polar and non-polar residues (which normally favors β-strands). However, this strand may not have been packed tightly enough in the protein core; it is able to make equally favorable interactions in the protein core when refolded as a helix. Finally, in Partition Puzzle: manu8170, challengers found two decoys that are lower in energy by about 5 kcal/mol (+50 Foldit points). The decoys differ from the design structure in a couple regions. First we see that the terminal helix can be unwound, and is "fraying" at the end. In the original design, these end residues (again, all polar residues) were floating off in solvent, and did not make very strong interactions with the rest of the protein; these residues can be unfolded relatively easy. We also see that this design has long loops that are made mostly of polar residues, and do not form regular secondary structure. Such polar, unstructured loops are expected to be flexible and disordered in solution; challengers were able to refold the loops while keeping the rest of the structure intact. The clear message from these early results is that long stretches of polar residues can be easily unfolded. The burial of non-polar residues is the main driving force of protein folding, and it's important that every region of a protein contributes to its core! 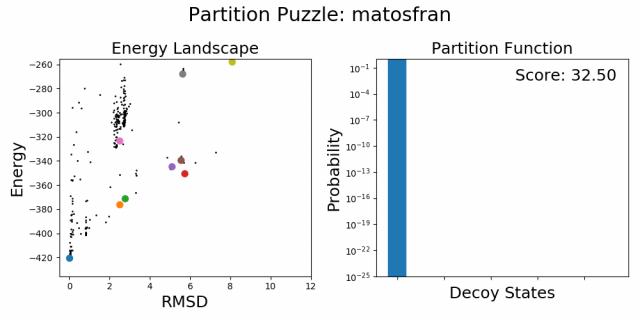 Below are the energy landscapes and partition functions for the remaining 17 Partition Puzzles, as of 18:00 GMT September 24. For an explanation of these plots, see this previous blog post. Some puzzles have seen very little activity, and their rankings may be artificially boosted due to a lack of challengers. 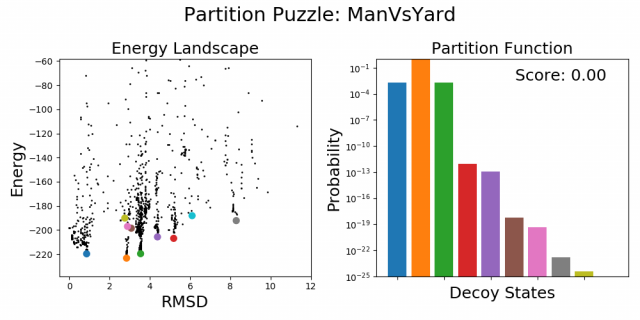 There is still plenty of opportunity to find high-scoring decoys in your opponent's Partition Puzzles! There are few players per puzzle, many black spots. Are several black spots coming from same players ? The black points represent all of the solutions we have for a puzzle, which includes multiple solutions from any player. If you're playing Foldit online, then your work is uploaded to the Foldit server every 2-5 minutes. These "intermediate" solutions can also give us some information about the energy landscape of a protein! -lower RMSD (2-6) structures ~100 foldit points away from the structure. I guess what I'm trying to ask is which of these is a more "effective challenge" to the protein's partition function? I would recommend focusing on the score. 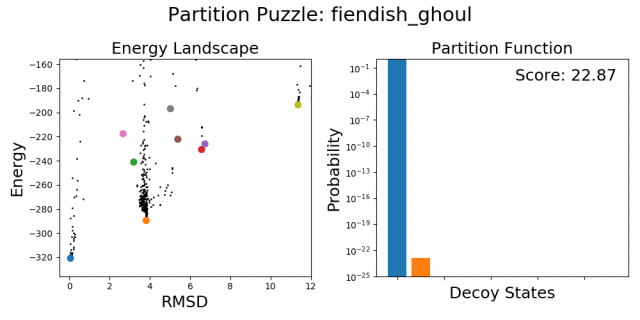 The RMSD doesn't matter (as long as it is >2.5 Å)—but remember from the blog posts that small improvements in score are amplified to large chunks of the partition function. However, something else to consider is that you don't want to duplicate someone else's work. 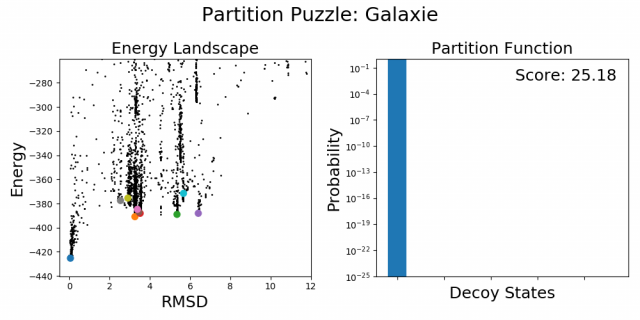 Before we calculate the partition function, we cluster all of the solutions to make sure we're not double-counting the same decoy state from two different players. So your solution needs to be 2.5 Å from the starting structure, but it also needs to be 2.5 Å from other players' solutions. Otherwise, your decoy will fall into the same cluster as the other player's decoy, and only one of you will claim a piece of the partition function—whoever has the higher-scoring (lower energy) solution. 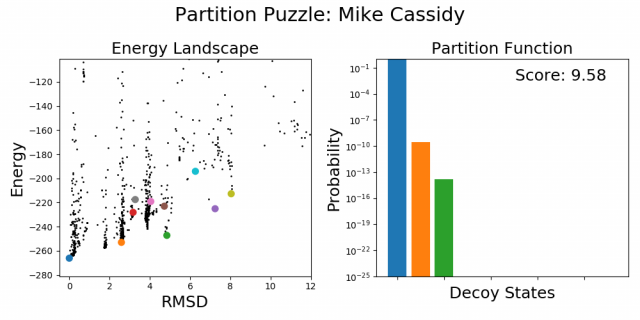 For this reason, it might be a good idea to look for higher RMSD decoys, especially if it looks like other players have already saturated the low RMSD range for that puzzle. Do proteins that occur in nature have sidechain bonds in the central core? I seem able to get loop ends and edge sheets to bond sidechains, but rarely sidechains in the middle of a "sandwich"